It’s been a long time waiting, but the first US-compatible UMTS Symbian device, the Nokia N75, is finally here! It was originally announced at the same time as the Nokia N95, and it was supposed to be available before the holidays last year, but it was delayed and surrounded with uncertainty for months. Even before that, other US-compatible UMTS Symbian devices (including a version of the Nokia N80) were supposedly being developed, but never materialized. So here are some pictures of my N75, including a size comparison with my N95. Then, how about a “hands-on” and a review? 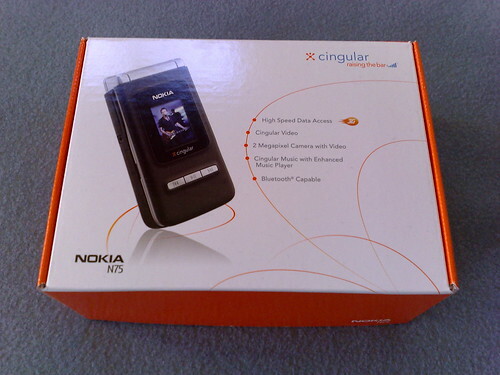 I just picked up an N73 Music Edition last week, which supposedly has UMTS support for 3g use with Cingular. But I haven’t been able to connect to any 3g networks. I think it doesn’t support UMTS over 850 mhz, which must be what’s in my area. Shoulda waited a week. Mind grabbing some photos with your N75? I’d like to see how the camera is.